Apple’s iPhone App Store is still crushing its peers, especially in the number of applications available to consumers. Apple currently has about 170,000 apps available, according to AppShopper.com. Its next closest competitor, Google Android, has about 30,000 apps available, a company exec recently said. Research In Motion has more than 5,000 apps available, according to the company. 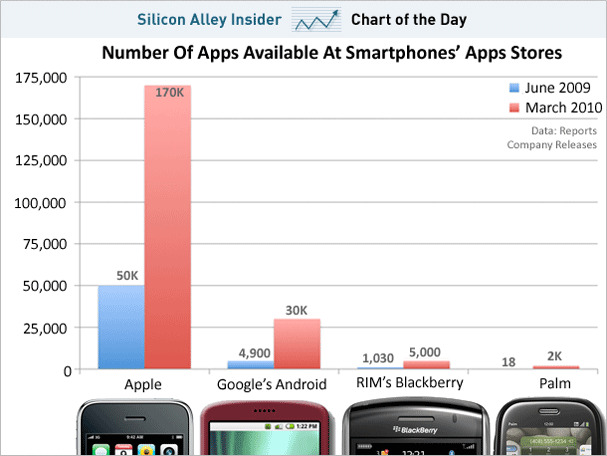 And Palm has “over 2,000 apps” in its app catalogue, CEO Jon Rubinstein said yesterday on his company’s earnings call. Meanwhile, Microsoft’s new Windows Phone 7 Series will launch with only a tiny handful of apps later this year.